13 Year Old Girl Attacked In San Jose Home, Video Shows Entire Incident. 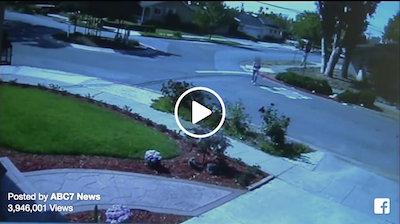 San Jose police are asking the public to use social media and help identify a man who forced himself on a 13-year-old girl as she returned home from school. Surveillance video shows the suspect barging into her home and trying to attack her as she successfully fends him off. Anyone with information about him has been asked to call San Jose police at 408-277-4102. GIRL FIGHTS OFF PREDATOR: A 13-year-old girl in the South Bay fought off a bold sexual predator who forced his way into her home. Police want to catch him before he strikes again. Full story on ABC7 News: http://abc7ne.ws/1Ebd1se SHARE this video so others can be on the lookout for this man. After You See What Was On This 8 Year Old’s Hand After Playing Outside, You Will Run To Wash Yours! WARNING: China Selling Products To America With Harmful Chemicals!